To quote former late-night host Craig Ferguson, "It's a great day for America." Scratch that — it's a great week for America. The U.S. women's national soccer team won its third FIFA World Cup, the Confederate flag waved its final hurrah with help of Bree Newsome and Gov. Nikki Haley, and Serena Williams clinched her 21st Grand Slam title with a dominating performance at Wimbledon. American women are making history, headlines, and headway — and we all know we love it. But let's talk a little about the rest of America, which may not love the power of these women, from Carli Lloyd and Christie Rampone to Newsome and Williams, as much as the rest of the girl-power crowd. As we know, women's sports hardly get airtime in America, and that has translated into much lower pay for America's top athletes, who are often more dominant than the American men in their respective fields. Bustle previously reported that women soccer stars make between $6,000 to $30,000 a year, yet the professional male players receive a minimum $50,000 salary. But have you seen the U.S. men's national soccer team winning three World Cups yet? No? Just checking. The same goes for women's tennis, despite being an internationally popular sport with an extraordinary high number of devoted fans and watchers. Although Williams is currently the most decorated player in women's tennis, her endorsement deals are way lower than what they should be. As ThinkProgress pointed out this week, Williams makes just $11 million in endorsements, while her lesser challenger, Maria Sharapova, accumulated $22 million in endorsements in 2014. Sharapova has been beaten by Williams more than a dozen times, and has just five Grand Slam wins to her name, compared to Williams remarkable 21 Grand Slam titles. You won five of the six Grand Slams you entered over the 2002 and 2003 seasons and looked utterly dominant in the process. Then you got sidetracked with injuries, pet projects, and indifference and have won only one major in the last seven you’ve played. I find those results hard to fathom. You’re simply too good not to be winning two Grand Slam titles a year. You’re still only 24, well within your prime. These are crucial years that you’ll never get back. Why not dedicate yourself entirely for the next five years and see what you can achieve? Is Everett out there right now eating her words, or patting herself on the back for thinking she's responsible for Williams' four consecutive Grand Slam wins? Probably the latter, unfortunately. Over the years, American sports fans have reacted to Williams with ambivalence and even disdain. "It’s weird, here you have Serena who won an Olympic gold medal representing the U.S. and has this rags-to-riches story, but it hasn’t helped her in the way it has helped prior black female athletes,” Lou Moore, a history professor at Grand Valley State University, told the Daily Beast. "[I]n Serena’s case, dominating a traditionally white, middle-class sport hits on American racism and sexism in such a way that it overrides the usual narrative." On the flip side, while soccer is a white, middle-class sport in the United States, the U.S. women's national soccer team has been playing second fiddle to America's lackluster men's team. In 2014, Americans may have been chanting "I believe," but, come on, didn't we already have our magical soccer moment in 1999, when the U.S. women beat out China in penalty kicks? Last Sunday, when the U.S. women's national soccer team became the first team in women's soccer history to win three World Cups, the team also broke another record — the game was the most-watched soccer match in U.S. history. Now, women's soccer in America is enjoying its watershed moment, one that many hope will turn into equal pay and leveled turf, so to speak. 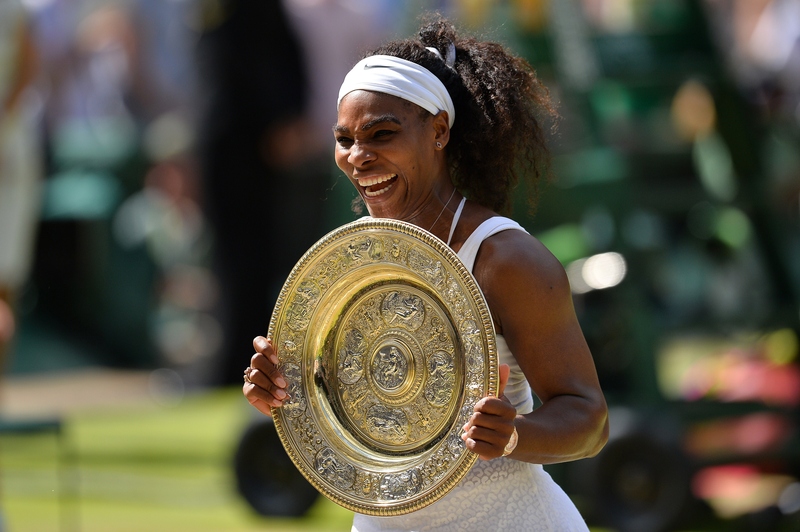 Williams, on the other hand, has her equal prize money — thanks to her sister Venus — and name recognition. She may still lack the people's support, but no one can ignore the irony that in the same year the Confederate flag ends its reign in the South, America's reigning athlete is a black woman.